Well today was an exciting day from start to finish. 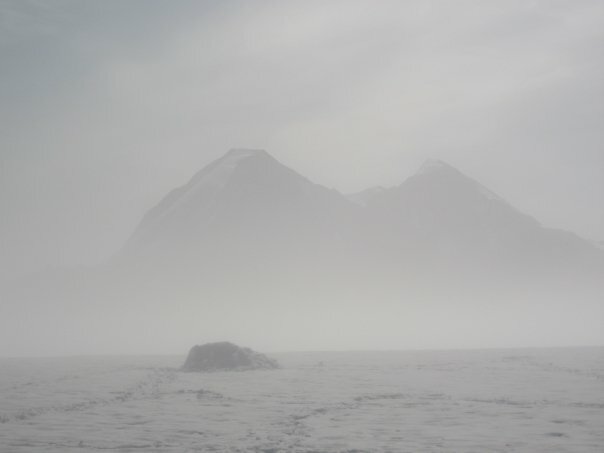 First we woke up to almost no visibility, but since we have to get to the ration plane by the 13th, we decided to go anyway. So we got packed up, ate and right before we got into our rope teams the instructors called a meeting. With frozen feet we all stood around and learned how to navigate in a whiteout with both a GPS and just a compass. It took a while, but I thought it was interesting. By 9:55 we were tying up and while I was putting on my rope, looked up to notice a shape forming in the clouds. After it got a little more clear, I was excited – the fog was lifting! Within 10 minutes, all of the fog lifted and out of it arose some of the most beautiful mountains I’d ever seen! We were completely surrounded and what’s better is we could then continue without whiteout navigation and really get moving. After navigating around some glacial lakes and more glacial swamps we began up a 6,000 ft pass. We made it over, and were then on the glacier feeding the East fork of the Susitna river. 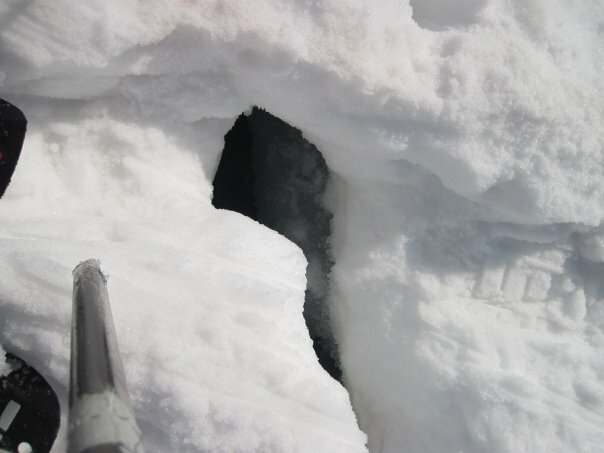 I fell into a crevasse, but don’t worry, I only went in up to my waist and then got hauled out. Surprisingly I wasn’t scared. 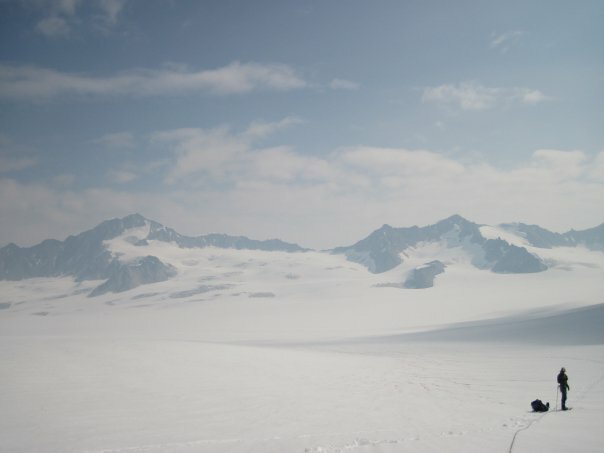 We walked for another hour, and eventually moved off snow and onto bare glacier. We took off our ropes, snowshoes and harnesses for the last time (YES! 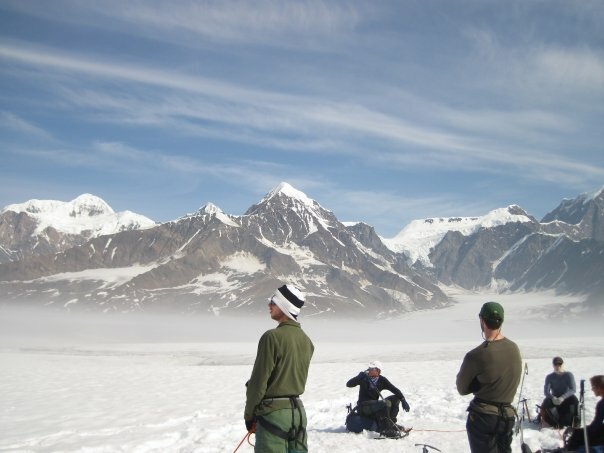 Snowshoes are hard to walk in) and moved down the glacier. It was really cool to watch the progression of tiny streams turn into larger ones and then small rivers as we walked. And since moving off glacier is all downhill, it was an easy hike! 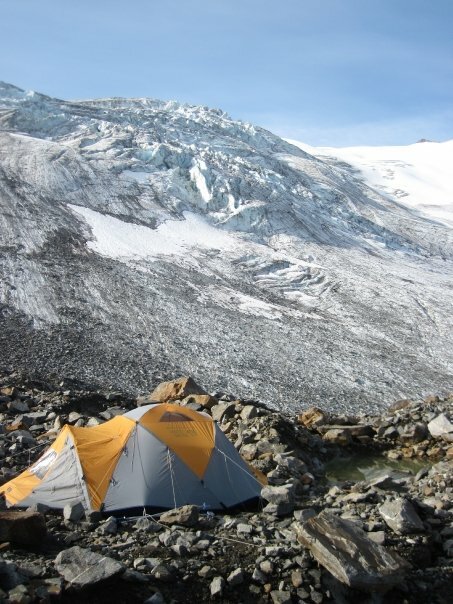 After hiking about six miles, we came to the medial murrain of the glacier and decided to camp on it. 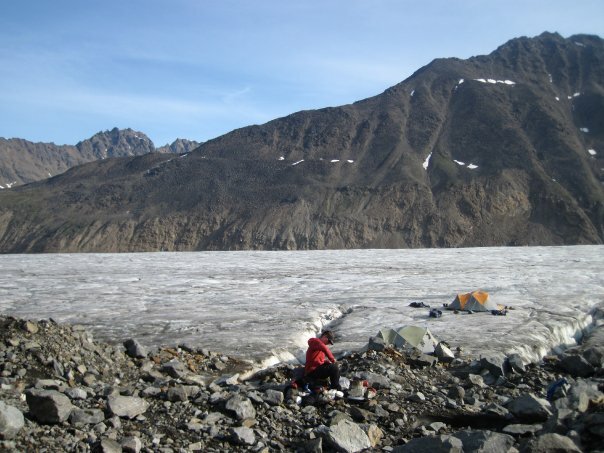 My group and one other group found flat places for tents on the rock, and the third tent and instructor tent camped on the glacier nearby. Our campsite is pretty comfy though, and I’ve really grown to enjoy rock camping. Everything stays dry while it’s still easy to build kitchens, seats, sleeping platforms and anchor the tent. After a beans and couscous dinner, I had my arctic explorer presentation [assignment I had been working on, mostly about flora and glaciology. We had to research these assignments by looking in books the instructors had and/or asking them lots of questions]. It went well! We’ve decided to camp here a second day, so we can have First Aid class tomorrow morning and then ice climb nearby in the afternoon. 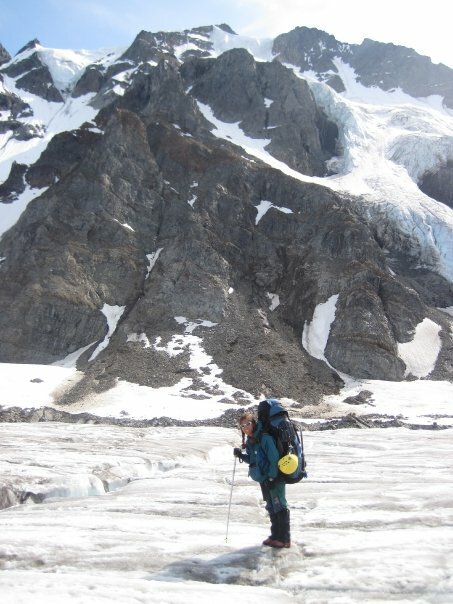 After that we’ll pack up the camp and hike 8 miles down and off the glacier to the place where we’ll get our last re-ration. 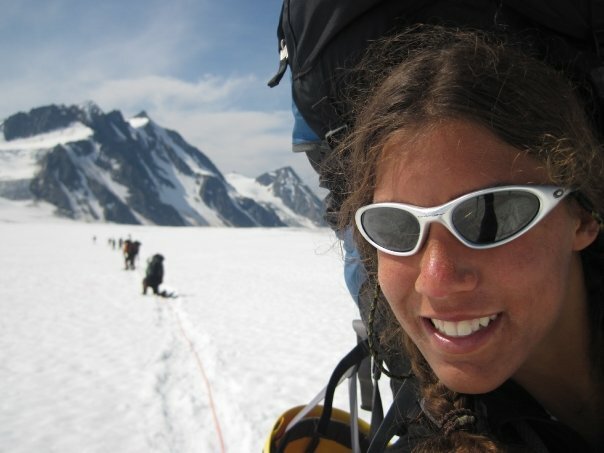 We’ll also get to give up our ropes and climbing gear, and get another tent so we can begin our 6 person student expeditions the following day.